A few years makes all the difference with Rafael Leonidas. Rafael Leonidas. Stealing my heart. And yours. 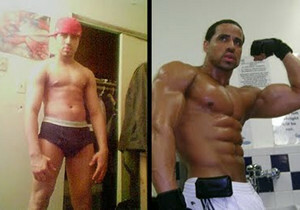 That top picture shows Rafael Leonidas before and after. 2003-2010. He’s cute in the picture on the left; most people wouldn’t kick him out of bed. But since he started taking bodybuilding seriously, he’s become a bonafide beefcake. The thing I love most about Rafael though, besides the fact that he’s Dominican, is the fact that he doesn’t have model features, or a typical fitness model body. Most tend to be leaner muscle, like Bo Roberts. I love his features, and I love model features, but sometimes, the most photogenic people are the ones with different features. And Rafael Leonidas is a perfect example of that. He’s got an amazing face, an amazing body, and features that drive me wild. Rafael Leonidas may just be one of the guys of my dreams. The most recent information about him that could be found is three years old, so it’s hard to determine what he’s up to now. But as of 2010, he lived in New York and was in college for physical therapy, health and wellness, and theater. He was (is?) a Personal trainer, model (fitness and fashion), designer (he was working on a clothing line), and was also in acting school. He’s also trying to get his fitness company off the ground. However, though fitness is is passion, he’s an artist and writes poems, short stories, and loves to dance. So he’s a busy guy. Rafael used to have a few websites, but sadly, he let them all expire. However you can check out Rafael Leonidas’ Model Mayhem profile here, and follow him on twitter here (though he doesn’t tweet often). He’s also on Instagram; you can follow him here. Eye Candy: Meet the Men of the 2014 Liquid Plumr Calendar!